Description: Wonderful study of unconventional and reversible Blackwork patterns for contemporary use. 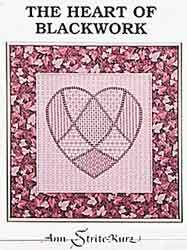 Includes 50 original patterns, many of which are composite treatments, combining a main network of blackwork with open stitch patterns, laidwork, beaded accents or a second blackwork pattern. Excellent for beginner and experienced stitchers alike.